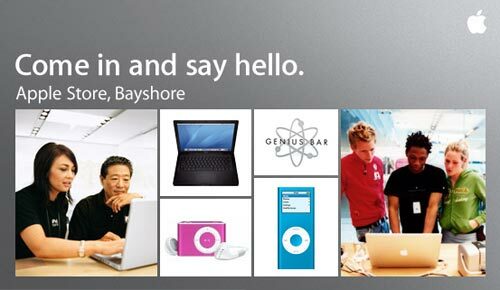 Grand Opening: Apple Store, Bayshore 6:00 p.m., Friday, June 29, 2007. Yup, that’s right! Another Milwaukee Apple Store. A good friend of mine works at this one. Sadly, I don’t think I can make the opening, but I do look forward to stopping by as soon as I can. Posted on Tuesday, June 26th, 2007 at 2:00 pm. Subscribe to the comments feed. Both comments and pings are currently closed. Post on your own blog. I plan on going on opening night – it is 2 blocks from my house. Is your friend anyone I know? Chad didn’t transfer, did he? I believe Chad is still at Mayfair… Ask for Jason T. at Bayshore.